California (we were there from May, 1984 until June, 2016). We moved to Kingman, Arizona in July, 2016. 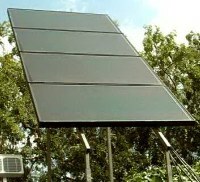 896 watt / 12 volt system consisting of 23 modules. system operated by a utitlity plant in Northern California. to the system on 7/31/05. 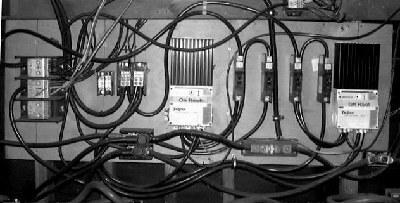 to the system in October 2008 as shown below. The systems output is less than the name plate rating of the modules. 1985 and installed the system in 1986.
due to the different sizes of modules. 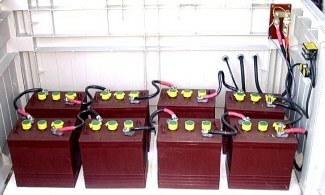 6 volt / 180 amp hour gel cells. They tap off the main system before the Class T fuse. These batteries have their own charge controller. It is a Flexcharge NC25A/12 with an external 100 amp charging contactor. when the gel batteries are charged and before the flooded batteries are charged. This allows both banks to reach full charge. it disconnects the gel batteries. going to a Class T fuse which is dedicated to the gel batteries. before going into the same fuse and disconnect. Each TriStar has a remote mounted meter to monitor the charging system. led lighting in our stock buildings. a Trace Micro-Sine grid inter-tie inverter. The racks are fabricated from stainless steel rectangular tubing. The mounting feet are stainless angle. 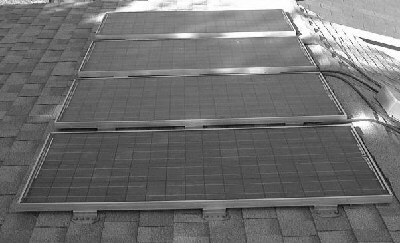 This 70 watt array is mounted on a 3-1/2" by 3-1/2" by 1/4"
It is imbedded in about 1-1/2 yards of re-inforced concrete. ones in our first system. 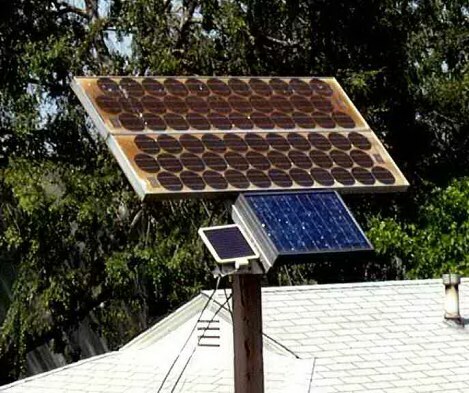 The smaller module is a 10 watt semi-crystalline Solarex. The racking is stainless steel angle. into two 35 amp hour AGM batteries. battery for a dual battery setup. This system provides outdoor work and area lighting. there is time to use it. Morningstar Sunsaver 20 charge controller. Trojan T-105 batteries wired in series for 12 volts / 225 amp hours. as well as in one of our stock rooms and a waterpump. Please look at the way the rack is mounted on the roof. of creating a water dam. weight and height of the array. 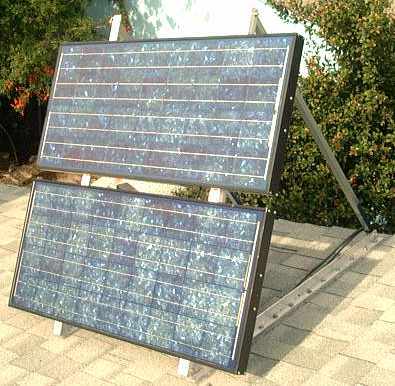 The Uni-Solar module was installed on 7/31/05. 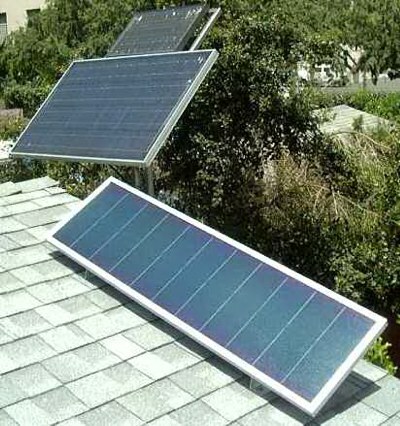 The two Solarex modules were installed on 12/25/05. Sharp 80 watt NE-80EJE module. 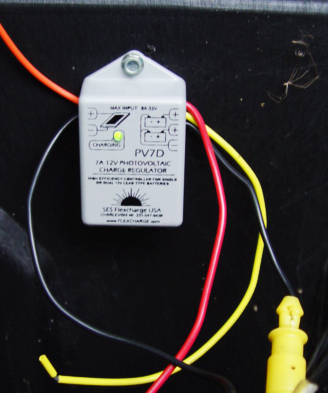 Photowatt module using 10 ga. tray cable. diodes and into a Flexcharge mod. NC30-12L charge controller with night-time function. two 10 ga. 2 conductor tray cables. 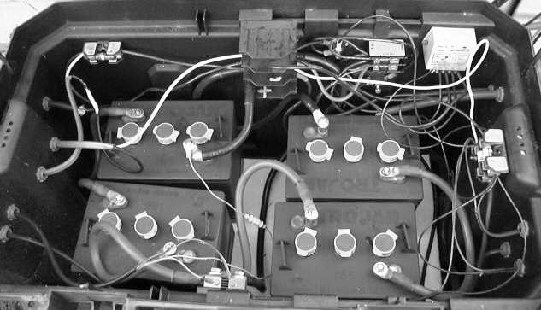 golf cart batteries wired in series/parallel for a 450 amp hour system capacity. fluoresent floodlight as well as for the packing/shipping area. as a small inexpensive inverter to power up a hot glue gun. consumption and pv array power production. The short circuit current of each module is app. 0.8 amp. are running at about 87 volts d.c. in full sun. tubing welded and bolted in place. before attaching washers and nuts. is combined in a fuse block and then into a disconnect switch. 100 feet of 8 ga. tray cable. more than big enough for the wire run distance. maximum power point charge controller. stainless steel 1/4"-20 threaded rod for stand-offs. nominal 24 volt charging rate (app. 28.2 volts). one pole for output) for safety. 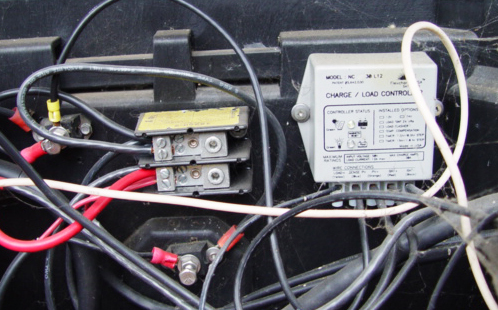 six volt batteries wired in series for a 24 volt system. a fuse in the battery box. power cable to an interior splicer block. wave inverter which powers up office equipment. lighting and a portable 24 volt d.c. fan. 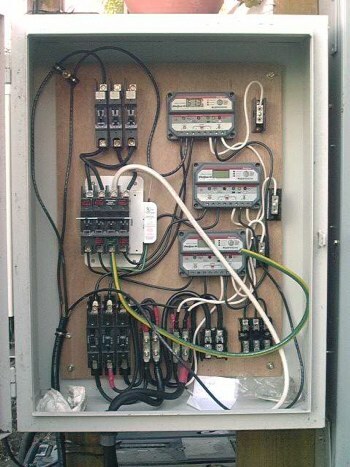 modules which are controlled by a Morningstar SunSaver 20L-12V controller. 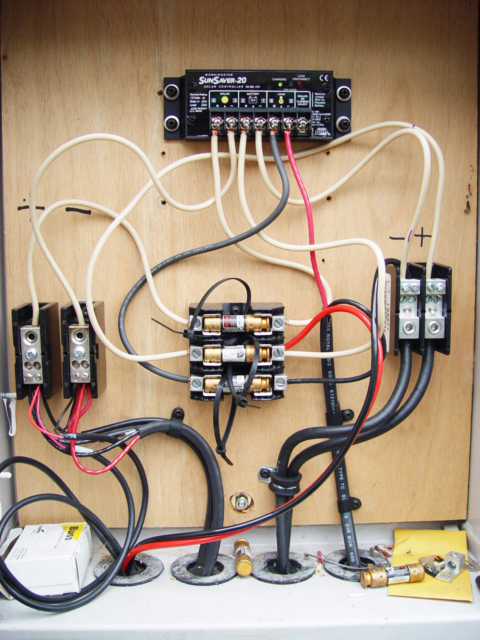 The controls are mounted in a outdoor telephone equipment box. mounted above a spring loaded louvere in the attic access hatch. The fan acts as a whole house fan. the front and back yard with used laundry water. Each fuse has a wire tie hanging from it for use as a disconnect. This system is a work in progress. well as provide 48 volt d.c. fluorescent lighting. Currently the system is powering up an Exeltech 125 watt sine wave inverter. As the system progresses we will show updated pictures and information. 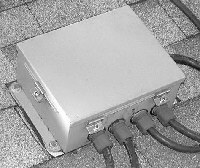 115 watts each and wired in series through a roof-top NEMA 4 box. The output cable (app. 85 feet) to the control cabinet is 6/3 tray cable. Three CF-125 / 15 amp circuit breakers. 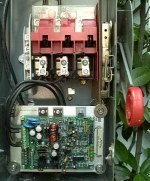 One Trace Photovoltaic Ground Fault Circuit Interrupter. Three Eaton Heinamann / Lucent 10 amp - 65 vdc rated circuit breakers. Three Morningstar ProStar 48 - 15M charge controllers. Because of shading problems, each array has its own charge controller. Numerous distribution and splicer blocks. Class R fuse blocks to protect the lighting circuits. Class T fuse blocks to protect the inverters. Six Trojan T-105 six volt batteries wired in series for 48 volts. Its output is fed through a 4 amp Steca charge controller. The rack is aluminum square tubing and angle. 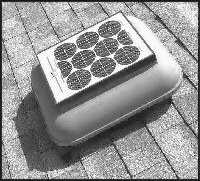 We have two of these solar powered attic fans. less than these early models.